The U.S. Coast Guard reported that a fire that burned for more than a day on an oil production platform off Louisiana’s coast was extinguished early on Saturday. The fire was initially reported at 2:50 a.m. local time on Friday by an offshore supply vessel, which had already evacuated the platform crew of 28 people. There is no information for injured workers. Local firefighting teams, after boarding the facility, officially reported around 6 a.m. local time that the platform in Breton Sound near environmentally delicate barrier islands off the state’s south-east coast took fire. According to information given by the Coast Guard officials, the light sheen of oil around the incident location appeared to be dissipating and moving away from the Breton National Wildlife Refuge on the surrounding islands. During the time, when the cleanup and repair works were still ongoing, crews with containment boom and skimmers were at sight. There were no reports of oil reaching shore or harming wildlife. According to preliminary assessments, authorities believe that storage tanks on the platform contain around 5,000 gallons of oil, which is much below the platform’s storage capacity of 168,000 gallons in total. 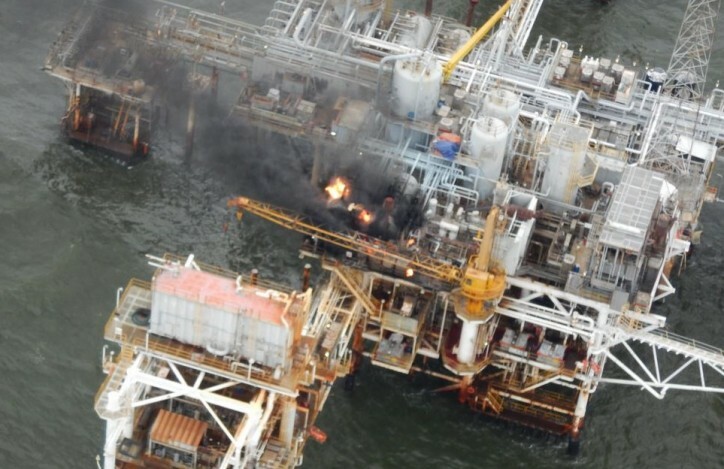 Representatives of the Texas Petroleum Investment Co, which is the platform’s owner and operator, said on Friday that the most probable reason for the incident was the platform compressor but still the cause was under investigation. David Marguiles, the Texas Petroleum Investment spokesman, said in a news release on Friday that the platform was shut down after the fire. Previously it was used to gather some 90,000 gallons of oil per day from a field of 50 to 60 wells in the area.